Scientists have re-examined an overlooked museum fossil and discovered that it is the earliest known member of the titanosauriform family of dinosaur. The team’s incorporation of Vouivria into a revised analysis of sauropod evolutionary relationships shows that by the Early Cretaceous period, brachiosaurids were restricted to what is now Africa and the USA, and were probably extinct in Europe. Previously, scientists had suggested the presence of another brachiosaurid sauropod dinosaur called Padillasaurus much further afield in what is now South America, in the Early Cretaceous. However, the team’s incorporation of Vouivria into the fossil timeline suggests that Padillasaurus was not a brachiosaurid, and that this group did not spread as far as South America. The Vouivria fossil was originally discovered by palaeontologists in the village of Damparis, in the Jura Department of eastern France, in 1934. Ever since, it has been stored in the Museum National d’Histoire Naturelle, Paris. It was only briefly mentioned by scientists in studies in the 1930s and 1940s, but it was never recognised as a distinct species. It has largely been ignored in the literature, where it has often been referred to simply as the Damparis dinosaur. Now, a deeper analysis of the fossil is also helping the scientists in today’s study to understand the environment Vouivria would have been in when it died, which was debated when it was initially found. The researchers believe Vouivria died in a coastal lagoon environment, during a brief sea level decline in Europe, before being buried when sea levels increased once more. 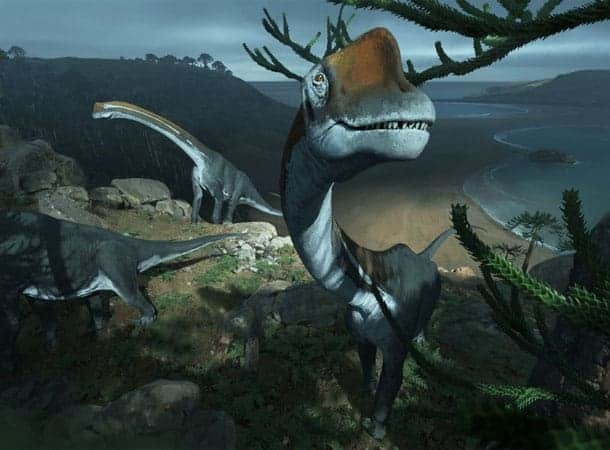 When the fossil was first discovered, in rocks that would have originally come from a coastal environment, researchers suggested that its carcass had been washed out to sea, because sauropods were animals that lived on land. Today’s team’s examination of Vouivria, coupled with an analysis of the rocks it was encased in, provides strong evidence that this was not the case. The genus name of Vouivria is derived from the old French word ‘vouivre’, itself from the Latin ‘vipera’, meaning ‘viper’. In French-Comte, the region in which the specimen was originally discovered, ‘la vouivre’ is a legendary winged reptile. The species name damparisensis refers to the village Damparis, from which the fossil was originally found. The research was carried out in conjunction with the Museum National d’Histoire Naturelle and the CNRS/Université Paris 1 Panthéon-Sorbonne, with funding from the European Union’s Synthesys programme.